Drop off in the morning and pick up on the way home. From work or play... seven days a week! We offer drop off after 7 am you can pick up laundry at store until 9:30 every day! We charge by the pound. Minimum order is 20 pounds, which is approximately one small laundry basket. Next day wash, dry and fold service available when in by 5 pm. Theresa enjoys the promptness and service Scott provides with his pickup and delivery service. Theresa says, "All I have to is put it away!" If your not satisfied, we are not satisfied. We will get the job done right for you! Pick up every day until 9:30 pm. Call today to find out how easy it is for us to wash your clothes for you - 727-323-0146! Let us do your wash today for you! Don’t waste another night or weekend doing laundry! Do you really enjoy folding underwear and sorting socks? Electric dryers are one of the most costly appliances in your home. Water restrictions are here to stay and the cost of water continue to increase. We have the personnel and capacity to do a great job for you! Next day wash dry and fold service is available upon request. We know you have a ton of other things you could be doing instead of your laundry. 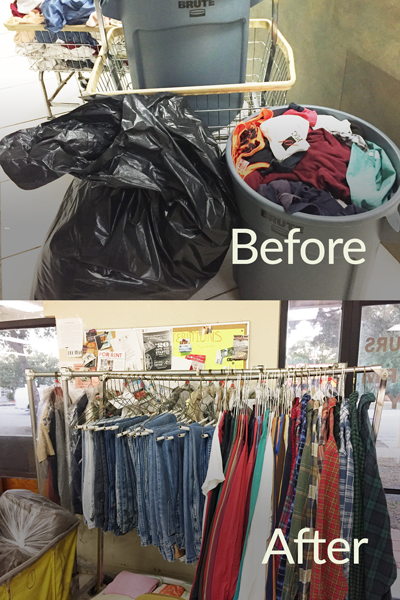 It only takes a few minutes to drop off your dirty clothing and a few minutes to pick up your professionally cleaned laundry. Oversized items are no problem for us. We have the large capacity machines to do large comforters, rugs, and sleeping bags. We offer the best quality and consistency in personal wash, dry and fold in the area. Our staff listens to your needs and performs the tasks required to keep you coming back. We are happy to hang clothes upon request. We follow your instructions on use of bleach, detergent and softener. We offer the finest quality at fair prices in the St. Petersburg area. We inspect your order to make sure it gets done right the first time. We have professional dry cleaning attendants on duty every day to help you. Call and schedule a pick-up service today - (727) 323-0146. We look forward to serving your laundry and dry cleaning needs. We understand that college students have a lot going on and laundry isn't usually at the top of the list. We provide piece of mind to parents who contact us to take over the wash, dry and fold laundy services for their kids. We currently service Eckerd College, USF-St. Pete, Stetson and other area colleges. Call today and find out how to get started using us for pick-up services - (727) 323-0146.